Nurse practitioner Debra Brown guides patient Merdis Wells through a diabetic retinopathy exam at University Medical Center in New Orleans. 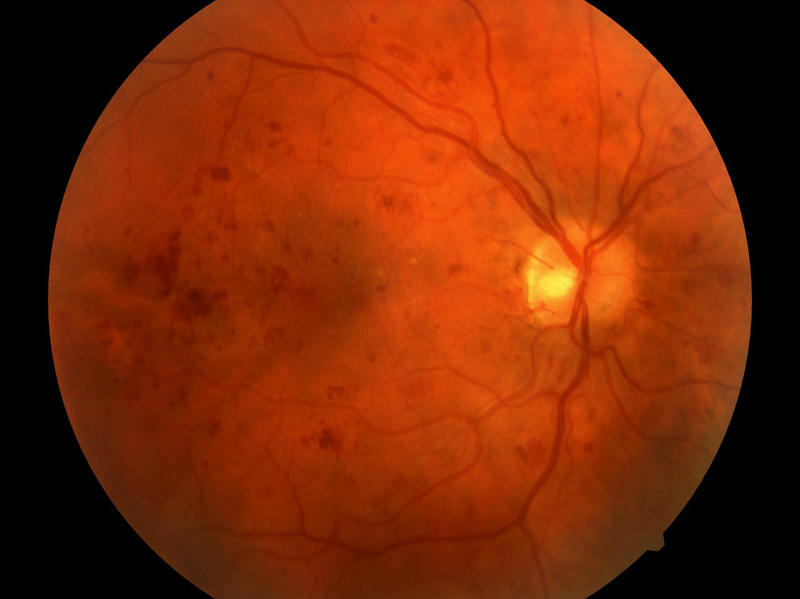 A retinal image shows severe nonproliferative diabetic retinopathy, a vision-threatening form of the disease, characterized by hemorrhages (the darker red spots in the image) across the retina. 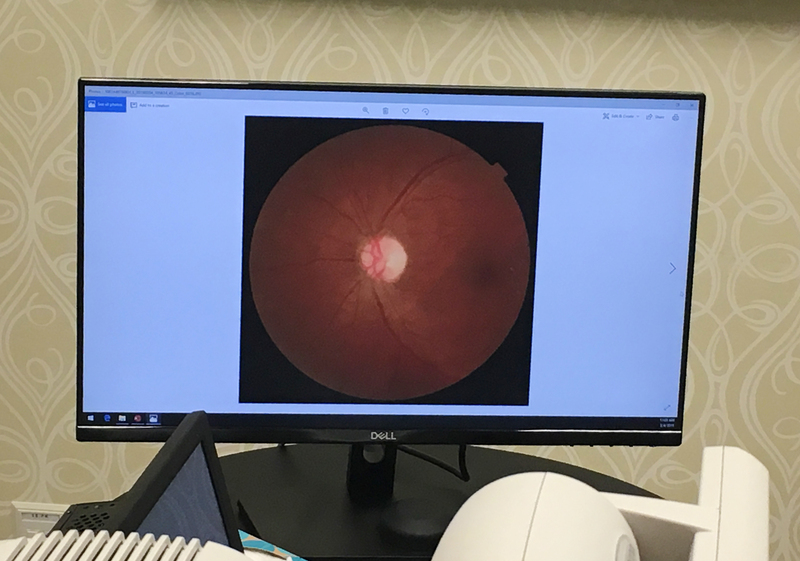 A retinal scan is displayed at University Medical Center in New Orleans using software detects is called diabetic retinopathy. Making a medical diagnosis used to be a doctor's responsibility. But now you might be diagnosed in a different way with artificial intelligence. NPR's Richard Harris looks at how one potentially sight-saving technology got invented and approved and how it's already being used to detect disease. RICHARD HARRIS, BYLINE: The condition that the software detects is called diabetic retinopathy. It's the most common cause of blindness in the United States and an understandable worry to Merdis Wells, who was at the University Medical Center in New Orleans in early February to get her eyes checked. DEBRA BROWN: You can come on in - straight ahead. HARRIS: Last time she was here, the clinic used the expert diagnostic skills of nurse practitioners to do this screening. So have you heard that this is a new machine? MERDIS WELLS: No, I didn't know that. HARRIS: A computer does the diagnosis. WELLS: Oh, really? I didn't know that. Do I get to see the pictures? BROWN: Yes, you do. You still get to see the pictures. WELLS: Oh, OK. I love that. HARRIS: You like seeing the picture. WELLS: Yeah. I like seeing me (laughter) because I want to take care of me, so I want to know as much as possible about me. HARRIS: And how do you feel about the computer helping make this diagnosis? WELLS: I think that's lovely. HARRIS: Nurse practitioner Debra Brown is also hopeful about the new technology. She says it could allow the clinic to screen a lot more patients for diabetic retinopathy. The device does not require her specialized knowledge of eye disease. She can pass the job off to anyone with a high school education. BROWN: And we actually get a report that's printed out now immediately. And it tells us whether it's positive or negative. And we respond accordingly. HARRIS: Merdis Wells is one of the very first patients to give it a go at this clinic. Information for the computer algorithm is gathered in an instrument that takes pictures of her retinas. It has two eye pieces like a fancy microscope. Wells puts her chin on the chin rest. BROWN: So I need you to look straight ahead. I'm going to take two pictures of each eye. OK? It's just going to be like taking a regular picture. But when we flash, the light would be a little bright. And we want you to look at that green dot. HARRIS: Brown turns off the room lights and, after a quick adjustment, is ready to proceed. BROWN: All right. Did you see that dot straight ahead? BROWN: Keep it still there. Don't blink - three, two, one, zero - good job. HARRIS: Flash, flash, flash. And in minutes, the test is over. Before we get to the results, it's worth spending a few minutes to understand how this machine, which can replace a human expert, came into being. It's the brainchild of Michael Abramoff, an ophthalmologist at the University of Iowa. MICHAEL ABRAMOFF: The problem is many people with diabetes only go to an eye care provider like me when they have symptoms. And we need to find it before then. So that's why early detection is really important. HARRIS: Abramoff spent years developing a computer algorithm that could scan retina images and automatically pick up early signs of diabetic retinopathy. ABRAMOFF: And I thought, well, if we do this with a computer, it can be faster, maybe better. And especially, it can be done where the patients are. HARRIS: He founded a company, IDx, to actually get this machine on the market. ABRAMOFF: It turns out that the biggest hurdle, if you care about patient safety, is the FDA. HARRIS: That hurdle is essential for public safety but challenging for a brand-new technology, especially one that makes a diagnosis without an expert on hand. Often, medical software gets an easier road to market than, say, a new drug. But this technology was unique. And a patient's vision is potentially on the line. ABRAMOFF: And, of course, they were uncomfortable at first. And so we started working on how - together - on how we prove that this can be safe. HARRIS: Abramoff needed to show that this was not just safe and effective, but it would work on a diverse population since all sorts of people get diabetes. That ultimately meant testing the machine out on 900 people at 10 different sites. ABRAMOFF: We went into inner cities. We went into southern New Mexico to make sure we captured all those people that needed to be represented. But it was always primary care clinics, never an ophthalmology clinic. HARRIS: That would put it to the test among the nonexperts who could well be running this machine. That extensive trial satisfied the FDA that the test would be suitable anywhere. And it did a reasonable job of picking up early signs of the disease. ABRAMOFF: It's better than me. And I'm a very experienced retinal specialist. HARRIS: The FDA approved this system called IDx-DR last April. Bakul Patel heads the FDA office that's shaping the algorithm approval process. Officials are bracing for a flood of applications because AI technology is evolving rapidly. Patel says, in general, the FDA expects more evidence and assurances for technologies that have a greater potential to cause harm if they fail. BAKUL PATEL: So that's how we think about it. And that's the burden - are sort of the expectation we set on people who are making these products. HARRIS: A simple tweak in a routine piece of software may not require any FDA review at all. The rules are tighter for a change that could substantially alter the performance of an artificial intelligence algorithm. PATEL: We expect people to come back to FDA and review that. HARRIS: It's a brave, new world here. And I'm wondering, how do you feel that you're grappling with this and sort of finding systems that makes sense for the entire spectrum of software that's coming down the pipe? PATEL: We realize that we have to reimagine how we look at these things and allow for the changes that go on, especially in the space. HARRIS: In fact, the FDA is testing out a whole, new approach to clearing algorithms. The agency is experimenting with a system called precertification, which puts more emphasis on examining the process that companies use to develop their products, less emphasis on examining each new tweak and more time tracking real-world performance. PATEL: We are going to take this concept and take it on a test run. HARRIS: Patel certainly does not want to see a high-profile failure. That could set back a promising and rapidly growing industry. Of course, FDA clearance is focused on the performance of the product itself. It doesn't guarantee medical care will get better. Every new technology has ripple effects. At the diabetes clinic in New Orleans, for example, this system replaced a service that also checked for another cause of blindness; glaucoma. This machine can't test for glaucoma. At least on this visit, Merdis Wells did get an expert to review her retina images with her. CHEVELLE PARKER: All right. So here's your right eye. OK? 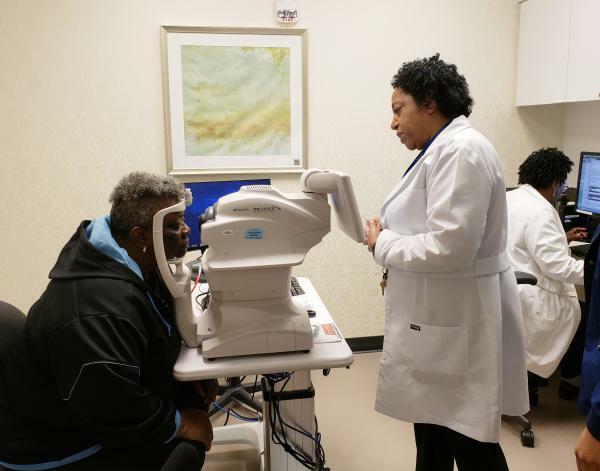 HARRIS: Nurse practitioner Chevelle Parker points to some silvery lines inside the eyes' blood vessels. PARKER: That happens when your sugar levels are high. And it can also happen from smoking. OK? PARKER: It could also be an indication of diabetic retinopathy. PARKER: And so we're going to do a referral and send you on for complete testing. HARRIS: The software did its intended job. Wells is unsettled by the news and wants to leave as quickly as possible. PARKER: No problem at all. HARRIS: At least she's found out about this concern early while there's still time to treat it. Richard Harris, NPR News. Transcript provided by NPR, Copyright NPR.